1982 Krapivin V.F., Svirezhev Yu.M., and Tarko A.M. Mathematical Modeling of the Global Biosphere Processes. Moscow, Nauka, 1982. 272 pp. (in Russian). 1985 Moiseev N.N., Aleksandrov V.V., and Tarko A.M. Man and Biosphere. System Analysis Experience and Model Experiments. Moscow, Nauka, 272 pp. (in Russian). 1986 Alexandrov G.A., Svirezhev Yu.M., Tarko A.M. et al. Mathematical Models of Ecosystems. Ecological and Demographic Consequences of a Nuclear War. Moscow, Nauka, 1986. 176 pp. (in Russian). 2005 Tarko A.M. Anthropogenic Changes of the Global Biosphere Processes. Mathematical Modeling. - Moscow. Fizmatlit. 2005. 232 pp. (in Russian). LC 2005478538. 2007 Kurbatova A.I. Tarko A.M., Zvolinsky V.P. Mathematical Modeling of the Impact of Man-Caused Pollution on Forest Ecosystems. - Moscow, published by Peoples' Friendship University of Russia, 2007, 136 pp. (in Russian). 2007 Bushuev V.V., Golubev V.S., Zvolinsky V.P., and Tarko A.M. Socio-humane Development: Russia and the World. - Moscow. Published by , 2007, 88 pp. (in Russian). 1971 Tarko A.M. Modeling of the reliability properties of physiological organs based on one construction of finite automata. In: Actual Problems of Space Biology and Medicine. Moscow, 1971. p. 262-263 (in Russian). 1972 Gurfinkel V.S., Mirsky M.L., Tarko A.M., Surguladze T.D. Functioning of Human Motor Units during Initiation of Muscle Tension., Biophysics, (Biofizika), 1972. V. XVII. N 2, p. 315-322. 1977 Polyakov B.I., Petrenko B.E., Cavvin A.B. Tazetdinov I.G., and Tarko A.M. Cardiovascular Reactions to Orthostatic Tests and the Resistivity of a Man to Vestibular Stimuli. Space Biology and Airspace Medicine, 1977. V. II. N 3, p. 48-52 (in Russian). 1977 Tarko A.M. The Global Role of the "Atmosphere - Plants - Soil" System in Compensating for the Impacts on the Biosphere. Transactions, USSR Academy of Sciences", 1977. V. 237. N 1, p. 234-237. (in Russian). 1981 Svirezhev Yu.M., Tarko A.M. The Global Role of the Biosphere in Stabilization of Atmospheric C02 and Temperature. In: Carbon Cycle Modeling, SCOPE 16. John Wiley, 1981. p. 355-364. 1982 Tarko A.M. Modeling the Global Biosphere Processes in the Atmosphere - Plants - Soil System. In: Dynamic Modeling in Agrometeorology, Hvalensky Yu.A. (Ed. ), Leningrad, Gidrometeoizdat, 1982. p. 8-16. (in Russian). 1983 Moiseev N.N., Aleksandrov V.V., Krapivin V.F., Lotov A.V., Svirezhev Yu.M., Tarko A.M. Global Models, the Biospheric Approach: Theory of the Noosphere. IIASA, 1983. CP-83-33, 50 pp. 1983 Sadulloev R.I., Tarko A.M. A Mathematical Model of Cotton Plant Growth and Development. Transactions, Tajik Academy of Sciences, 1983. V. XXVI. N. 8, p. 524-527 (in Russian). 1984 Novichikhin E.P., Tarko A.M. Modeling the Global Biogeochemical Cycles of Carbon and Nitrogen in the System Atmosphere - Plants -Soil. Vestnik, USSR Academy of Sciences, Biology, 1984.N 2, p. 273-281. (in Russian). 1985 Moiseev N.N., Svirezhev Yu.M., Krapivin V.F., and Tarko A.M. Biosphere Models. In: Climate Impact Assessment. SCOPE 27. Kates R.W., Ausubel J.H., and Berberian M. (Eds. ), John Wiley, 1985. p. 493-510. 1985 Kravchenko P.Z., Safonov I.V., Tarko A.M. A Discrete Model of Salmon Population Dynamics Based on Age Structure Description. Mathematical Modeling in Biogeocenology. Petrozavodsk, 1985. p. 162-163. (in Russian). 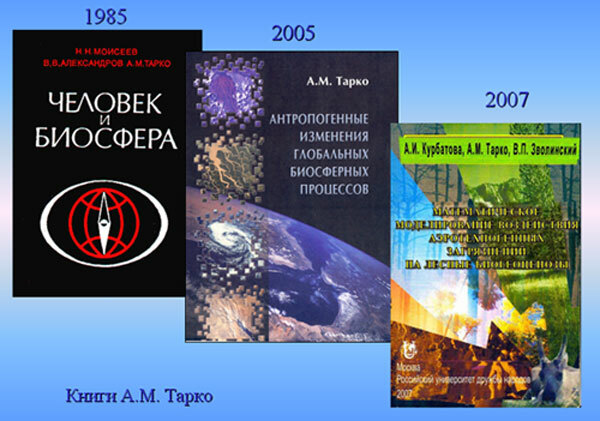 1987 Armand A.D. Vedyushkin M.A., Tarko A.M. A Model of Pollution Influences on Woody Biogeocenoses. In: The Influence of Industrial Plants on the Environment, Krivolutsky D.A. (Ed. ), Moscow, Nauka, 1987. p. 291-296. (in Russian). 1987 Tarko A.M., Vedyushkin M.A., Pisarenko N.F., and Tatarinov F.A. Modeling of the Industrial Contaminants Impact on Forest Ecosystems. Moscow, Computer Centre, USSR Acad. of Sciences. 1987. 19 pp. (in Russian). 1999 Tarko A.M., Bogatyrev B.G., Kirilenko A.P., Konovalova E.I., Pisarenko N.F., and Udalkina M.V. Modeling of Global Carbon Dioxide Cycle. Moscow, Computer Centre, USSR Academy of Sciences, 1988. 43 pp. (in Russian). 1988 Tarko A.M., Drozdov A.L., Konovalova E.I., Pisarenko N.F., and Tatarinov F.A. Model of Acid Rain Impact on Forest Ecosystems. Moscow, Computer Centre, USSR Acad. of Sciences, 1988. 27 pp. (in Russian). 1988 Udalkina M.V., Bazilevich, N.I., Bogatyrev, B.G., Kirilenko A.P., and Tarko A.M. Investigation of Forest Ecosystems Production Process in Medium Latitudes of Northern Hemisphere Using a Data Bank. In: Problems of Ecological Monitoring and Ecosystems Modeling. Leningrad, Gidrometeoizdat. 1988. V. 11, p. 80-89. (in Russian). 1991 Moiseev N.N., Parkhomenko V.P., and Tarko A.M. System of Models for Investigation the Dynamics of Atmosphere - Biosphere Relations. KAPG Assembly, Symposium on Geophysical Aspects of the International Geosphere - Biosphere Program Global Change, Prague, Czech Republic, 1991. 14 pp. 1992 Tarko A.M., Bogatyrev B.G., and Kirilenko A.P.). 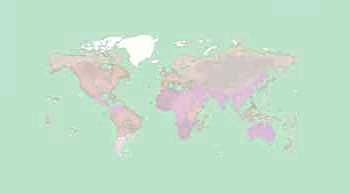 The Role of the Countries and Regions in Forming the Carbon Dioxide Budget of the Atmosphere. Transactions (Doklady) of the USSR Academy of Sciences, 1992. V. 322, N 3, p. 610-613 (in Russian). 1993 Nefedova E.I., Tarko A.M. Study on the Global Carbon Cycle using a Zonal Model of the Atmosphere - Ocean System. Transactions (Doklady) of the USSR Academy of Sciences, 1993. V. 333. N 5, p. 645-647 (in Russian). 1994 Tarko A.M. A Model of the Global Carbon Cycle. Nature (Priroda), 1994. N 7, p. 27-32. (in Russian). 1994 Golubev V.S., Tarko A.M., Malinovsky Yu.M. A Review of the book: Losev K.S., Gorshkov V.G., Kondratyev K.Ya., et al. Problems of Ecology of Russia . Vestnik, the Russian Academy of Science, 1994. V. 64. N 12, p. 1134-1136. (in Russian). 1995 Nefedova E.I., Tarko A.M. A Zonal Model of the Global Carbon Dioxide Cycle in the System Atmosphere - Ocean. Oceanology, 1995. V. 35. N 1, p. 11-15. (in Russian). 1995 Tarko A.M., Bykadorov A.V., and Kryuchkov V.V. Modeling the Atmospheric Contamination Impact on Forest Ecosystems in a Region. Transactions (Doklady) of the Academy of Sciences, 1995. V. 341. N 4, p. 571-573. (in Russian). 1995 Tarko A.M. Stability of Biospheric Processes and the Le Chatelier principle. Transactions (Doklady) of the Academy of Sciences", 1995. V. 343. N 3. p. 593-595. (in Russian). 1996 Tarko A.M., Nefedova E.I, Usatyuk V.V. Prediction of Regional and Global Human Impacts on Climate and Biosphere with the Aid of Coupled Carbon Cycle and Climate Models. In: Climate Variability and Climate Change Vulnerability and Adaptation. Proceedings of the Regional Workshop. Ivana Nemesova (Ed.). Prague, Czech Republic, Inst. of Atmospheric Physics, Czech Academy of Sciences, 1996. p. 147-162. 1997 Golubev V.S., Tarko A.M., Malinovsky Yu.M., and Savenko V.S. Eternal Russian themes in educational book (Polemic notes). Social Sciences and Modern Times, 1997. N 5, p, 159-166. (in Russian). 1998 Nefedova E.I. Pervanyuk V.S., and Tarko A.M. A Spatially Distributed Model of Global Carbon Cycle in System Atmosphere - Ocean System. Moscow, Computing Centre of the Russian Academy of Sciences. 1998. 25 pp. (in Russian). 1998 Parkhomenko V.P., Tarko A.M., Tsarevsky N.A. Pervanyuk V.S., Kuznetsova M.V., Utrobina T.V. Modeling the Global Processes of the System "Ecology - Climate - Economy" Using Method of Multialternative Cooperative Computations. In: Problems of Ecoinformatics. 3d International Symposium. Moscow. A.S. Popov Society. 1998. (in Russian). 1999Begelman G.Z., Tarko A.M. Model of the Global Biosphere Carbon Cycle with High Spatial Resolution. Transactions on Applied Mathematics, Computing Centre of the Russian Ac. Sc. Moscow, 1999. 26 pp. (in Russian). 1999 Tarko A.M., Kuznetsova M.V. Novokhatskij V.N. Mathematical Modeling of the Social Dynamics. In: Socio-historical Process: Myths and Reality. Moscow, Published by Papirus Pro, 1999. p. 63-66. (in Russian). 1999 Mochalov A.A., Parkhomenko V.P., Tarko A.M. Global Warming and Arctic. - Ecology and Life. 1999. N 4. p. 38-40. (in Russian). 2000 Parkhomenko V.P., Tarko A.M. The "Nuclear Winter". Ecology and Life, 2000. N 3. p. 44-47. (in Russian). 2000 Pervanyuk V.S., Tarko A.M. Model biogeochemical carbon cycle in the global spatial system ocean - atmosphere. - In Sat: Modern problems of fundamental and applied sciences. XLIII Scientific Conference of the Moscow Physical-Technical Institute. Abstracts. SRD MIPT, Moscow - Dolgoprudnyy, 2000, part 7, p.48. (in Russian). 2000 Tarko A.M. Variants of survival. - Alphabet. 2000, N 14, p. 8-9. (in Russian). 2000 Trusenkova M.S., Tarko A.M. A mathematical model of the dynamics of civilization. - In Sat: Modern problems of fundamental and applied sciences. XLIII Scientific Conference of the Moscow Physical-Technical Institute. Abstracts. SRD MIPT, Moscow - Dolgoprudnyy, 2000, part 7, p. 38. (in Russian). 2000 Utrobina T.V., Tarko A.M. Analytic model of dynamic processes in forest-steppe under climate change. - In Sat: Modern problems of fundamental and applied sciences. XLIII Scientific Conference of the Moscow Physical-Technical Institute. Abstracts. SRD MIPT, Moscow - Dolgoprudnyy, 2000, part 6, p. 8 (in Russian). 2001 Tarko A.M. Investigation of global biosphere processes with the aid of a global spatial carbon dioxide cycle model. - Sixth International Carbon Dioxide Conference, Extended Abstracts. Tokohu University, Sendai, Japan, 2001, V. 2. p. 899-902. 2001 Pervanyuk V.S., Tarko A.M. Spatial Seasonal Model of the Global Carbon Dioxide Cycle in "Ocean - Atmosphere" System. - Sixth International Carbon Dioxide Conference, Extended Abstracts. Tokohu University, Sendai, Japan, 2001, V. 2.p. 992-995. 2001 Pervanyuk V.S. Tarko A.M. Modeling the global carbon cycle in atmosphere-ocean system. - Mathematical Modeling, 2001, V. 13, N 11, p. 13-22. (in Russian). 2001 Tarko A.M. Modeling the global carbon cycle to predict human-induced changes in the biosphere - Mathematical Methods in Ecology. Abstracts of the All-Russia scientific school. Petrozavodsk, Karelian Research Center RAS, 2001, p. 40-41. (in Russian). 2001 Tarko A.M. greenhouse effect and climate. - Ecology and Life, 2001, N 1, p. 48-51. (in Russian). 2001 Tarko A.M., Kuznetsova, M.V. Spatially distributed model of the global carbon cycle in the biosphere. - Mathematical Modeling, 2001, N 9, p. 45-54. (in Russian). 2001 Tarko A.M., Parkhomenko V.P. A virtual museum N.N. Moiseev is created. - Ecology and Life, 2001, N 2, p. 9. (in Russian). 2001 Tarko A.M., Parkhomenko V.P. Teaching N.N. Moiseev of the biosphere and its development in the mathematical disciplines. - Recent developments of civilization. Scientific Papers MNEPU, MA, Published by MNEPU, issue 6, 2001, p. 81-93. (in Russian). 2001 Tarko A.M., Trofimov S.Ya., Dorofeeva E.I. Model of the carbon cycle and nitrogen to forest ecosystems. - Mathematical Methods in Ecology. Abstracts of the All-Russia scientific school. Petrozavodsk, Karelian Research Center RAS, 2001, p. 247-248. (in Russian). 2001 Trofimov S.Ya., Dorofeeva E.I., Tarko A.M. Simulation of global warming on forest ecosystems of temperate latitudes. - Proceedings of the international conference "Biological resources and sustainable development." Pushchino, 2001, p. 230-231. (in Russian). 2001 Utrobina T.V., Tarko A.M. A simulation model of forest ecosystem. Proceedings of international conference "Biological resources and sustainable development." Pushchino, 2001, pp. 230-231. (in Rusian). 2002 Bushuev V.V., Golubev V.S., Golubev SV, Tarko A.M. Stability and development in EKOS. - Energetic in the global system "Nature - Society - Man." Published by "Papyrus PRO, 2002. 64 p. (in Rusian). 2002 Parkhomenko V.P., Tarko A.M. Analysis of contemporary problems of the world, and Russia - Computing Center RAS, Communications in Applied Mathematics. 2002, 54 pp. (in Rusian). 2002 Tarko A.M. Investigation of anthropogenic dynamics of global biosphere processes by modeling the biogeochemical cycle of carbon. - Abstracts of scientific conference , devoted to the 85 th anniversary of academician N.N. Moiseev. Computing Center RAS, Communications in Applied Mathematics. - 2002, p. 16. (in Rusian). 2002 Tarko A.M. Study of global processes of the biosphere on the basis of modeling the carbon cycle. - Link of Times, Moscow, MGVP COX, 2002, pp. 178-190. (in Russian). 2002 Tarko A.M. Mathematical modeling of global processes in the biosphere. - Ekoetika-XXI century. On the International Science Congress (23-27 December 2002). MSTU. NE Bauman. M., "Pure water". 2004. p. 93-99. (in Rusian). 2002 Tarko A.M. N.N. Moiseev on the development problems of the biosphere and society. - Free Thought XXI, 2002, N 8, pp. 61-69. (in Russian). 2002 Tarko A.M. Potential primary productivity of terrestrial ecosystems. - Natural resources and ecology of Russia: Federal atlas. Ed. NG Rybalskyi, VV Snakin. Moscow, NIA-Priroda, 2002, p. 146-147. (in Russian). 2002 Tarko A.M. Teaching of N.N. Moiseev on the development of the biosphere and society. - Atlas of temporal variations of anthropogenic and natural social processes. Natural and social spheres as part of the environment and how objects influence, V. 3, Moscow, Scientific World, 2002, p. 12-19. (in Russian). 2002 Tarko A.M. Modeling the global cycle of carbon dioxide in the biosphere. - Ibid, p. 322-328. (in Russian). 2002 Tarko A.M. N.N. Moiseev on the development problems of the biosphere and society. - Free Thought XXI, 2002, N 8, p. 61-69. (in Russian). 2002 Trofimov S.Ya., Dorofeeva E.I., Tarko A.M., Fokin AD, Smolin, GA, Sokolova TA, Tolpeshta II, Luzikov AV Soil organic matter characterization of the functional organization of the soil system. Collective monograph ed. GV Dobrovolsky. Moscow, 2002. p. 140-226. (in Russian). 2003 Bushuev V.V., Golubev V.S. Tarko A.M. et al. Anthropogenic Processes and their Biological Compensating with Reference to CO2 Releases and Exception of Production of Natural Biota. - Geoecology. Engineering geology. Hydrogeology, Geocriology. Operation of Natural and nature-engineering Systems, Russian Academy of Sciences, 2003, N 1, p. 32-35. (in Russian). 2003 Tarko A.M. Analysis of Global and Regional Changes in Biogeochemical Carbon Cycle: A Spatially Distributed Model. - Interim Report, IR-03-041, IIASA, Laxenburg, Austria, 2003, 28 pp. 2003 Tarko A.M. Investigation of the Global Climatic and Biospheric Changes Based on the Biogeochemical Carbon Cycles Modeling. - World Climate Change Conference. Abstracts. Moscow September 29 - October 3, 2003, p. 507. 2003 Bushuev V.V., Golubev V.S., Golubev p.V., Tarko A.M. Anthropogenic processes and their biological compensation for emissions of CO2 and the removal of products of natural biota. - Geoecology. Engineering geology. Hydrogeology, Permafrost. The functioning of natural and natural-technical systems, Russia Academy of Sciences, 2003, N 1, p. 32-35. (in Russian). 2003 Tarko A.M. Scientific views and suggestions N.N. Moiseev on ways and methods to solve the problems of nature and society. - Russia on the road to sustainable development. Moscow, Moscow City Institute of Management the Government of Moscow, Publishing House NP, 2003, p. 139 - 153. (in Russian). 2004 Bushuev V.V., Golubev V.S., Tarko A.M. Indicators of social and nature development of Russia's regions. - Moscow, publishing house , 2004, 96 p. (in Russian). 2004 Tarko A.M. Two ways of sustainable development in Russia. - Sustainable development. Science and practice. Published by International University , 2004, N 2, p. 3-6. (in Russian). 2004 Tarko A.M. Mathematical modeling of global processes in the biosphere. Ekoetika - XXI century. Collection of works based on international scientific congress (23-27 December 2002). MVTU N.E. Bauman. Moscow, "Pure water". 2004. p. 93-99. (in Russian). 2006 Tarko A.M. Modeling the dynamics of civilization: the biosphere and man-made aspects. - Proceedings of the Seventh All-Russia scientific conference , devoted to the 15 th anniversary RosNOU (21-22 April 2006). - New University of Russia (RosNOU). 2006, Moscow: Published by RosNOU, part 1, p. 23-30. (in Russian). 2006 Golubev V.S., Tarko A.M. Biospheric rent. - Culture of healthy life. 2006. N 5, p. 41-43. (in Russian). Golubev V.S. 2006, Tarko A.M. What is the nature reserve of patience? - Ibid, N 4, p. 71-74. (in Russian). Golubev V.S. 2006, Tarko A.M. Russia and the world: demography, health, economy - Ibid, N 2, pp. 48-49. (in Russian). 2006 Tarko A.M., Kurbatova A.I. Influence of sulfur dioxide on forest ecosystems of European North as an example of "Combine Severonickel". - Actual problems of ecology and environmental management. Issue 8, part 3. Collection of scientific works. Published by RUDN, 2006, p. 4-12. (in Russian). 2006 Tarko A.M., Kurbatova A.I. Model of the impact of acid rain and sulfur dioxide on forest ecosystems - Ibid, p. 31-38. (in Russian). 2006 Kurbatova A.I., Tarko A.M. Simulation of airborned pollutions transfer of metallurgical plants Ibid, p. 13-19. (in Russian). 2006 Kurbatova A.I., Tarko A.M. One-dimensional mathematical model of the impact of atmospheric emissions of metallurgical plants on forest ecosystems. Ibid, p. 19-27. (in Russian). 2006 Kurbatova A.I., Tarko A.M. Analysis of the results of one-dimensional model of the impact of atmospheric emissions on forest ecosystems Ibid, p. 27-30. (in Russian). 2006 Pisarev DV, Tarko A.M. Development of a database for monitoring biospheric processes at the global and regional level - Ibid, p. 79-82. (in Russian). Golubev 2006 BC, Zvolinsky V.P., Tarko A.M., Tsariuk YB Systemic indicators of socio-natural (for example, the CIS countries). - Ibid, p. 38 - 64. (in Russian). 2006 Kurbatova A.I., Tarko A.M. Modeling the impact of atmospheric emissions of non-ferrous metallurgy in the forest ecosystems. - Bulletin of Peoples' Friendship University. A series of "Ecology and Nature", Published by RUDN. 2006. N. 1 (13) p. 150-156. (in Russian). 2006 Pisarev DV, Tarko A.M. Development of a database for monitoring processes at the global and regional levels. Interactive maps of Europe and Russia. Made in Computing Center RAS. 2006. (in Russian). 2007 Golubev V.S., Tarko A.M. Recipes of vital harmony. - Nature and Man ( ), N 5, 2007, p. 16-17. (in Russian). 2007 Tarko A.M. Scientific views and suggestions N.N. Moiseev to solve the problems of nature and society. - Actual problems of ecology and environmental management. Collection of scientific works. V. 9, part. 3. Moscow. Published by Peoples' Friendship University, 2007, p. 4-23. (in Russian). 2007 Kurbatova A.I., Zvolinsky V.P., Kuznetsova M.V., Tarko A.M. Limits of the Kyoto Protocol and the stability of the biosphere. - Actual problems of ecology and environmental management. Collection of scientific works. Issue 9, part 3, Moscow. Published by Peoples' Friendship University, 2007, p. 29-41. (in Russian). 2007 Tarko A.M. At the root of modeling of living systems. Ecology and life. 2007. N. 9, p. 40-46. (in Russian). 2007 Tarko A.M., Portnoy M.Yu. Modeling of high-tech lag of the Russia. Proceedings of 2 nd International Conference , (MMSED-2007), Russiav Social University, published by PFUR, Moscow., p. 254-255. (in Russian). 2007 Tarko A.M. Mathematical models of global and regional processes in the biosphere. - General and applied tsenologiya. 2007. N. 6, p. 44-47. (in Russian). 2008 Tarko A.M. Can we slow down global warming? - Russia in the outside world. Sustainable development: environment, politics, economy: Policy Yearbook. Ed. N.N. Marfenin, Moscow: Published by MNEPU, 2008, p. 17-43. (in Russian). 2008 Portnoy M.Yu., Tarko A.M. A mathematical model of the development of high technology. Moscow, Dorodnitsyna Computing Center. Communications on Applied Mathematics, 2008, 30 pp. (in Russian). 2008 Tarko A.M. N.N. Moiseev and the Development of the Science about Nature and Man. - On the necessary features of civilization of the future (scientific publication based on the International Scientific Forum on the 90 th anniversary of Academician N.N. Moiseev), Plenary Papers, ed. A.T. Nikitin S.A. Stepanov, - Moscow: Published by MNEPU, 2008, p. 36-46. (in Russian). 2008 Tarko A.M. Mathematical modeling of global processes in the biosphere. - On the necessary features of civilization of the future (scientific publication based on the International Scientific Forum on the 90 th anniversary of Academician N.N. Moiseev), Section "Modeling of the biosphere and climate and their impact on social and environmental well-being of people", ed. A.T. Nikitin, S.A.Stepanov - Moscow. Published by MNEPU, 2008, p. 197-199. (in Russian). 2008 Kuznetsova M.V., Parkhomenko V.P., Tarko A.M. Modeling the seasonal dynamics of the production process of terrestrial plants and atmospheric carbon dioxide in the global regime. - Ibid, p. 221-225. (in Russian). 2008 Tarko A.M., Portnoy M.Yu. Modeling of Russia's economic development based on the idea N.N. Moiseev about . - Ibid, p. 281-282 (on CD). (in Russian). 2008 Tarko A.M., Kurbatova A.I. Mathematical models of the impact of atmospheric pollution on forest systems in the region. - Ibid, p. 279-280 (on CD). (in Russian). 2008 Bushuev V.V., Golubev V.S., Tarko A.M. Indicators of socio-natural development: Russia and the World. - Social Sciences and Modernity, 2008. N 3. p. 143-155. (in Russian). 2009 Golubev V.S. , Bushuev V.V., Zvolinsky V.P., Tarko A.M. Socio-natural dynamics and management development. - Management of social innovation: experiences, problems and prospects: Proceedings of the international scientific conference. Moscow. Published by RUDN, 2009. p. 260-272. (in Russian). 2009 Tarko A.M. Analysis of the prospects of socio-economic development of Russia. - Ibid, p. 307-314. (in Russian). 2009 Tarko A.M., Zvolinsky V.P. Global warming and the possible prospects for Russia and the world. - Ibid, p. 296-306. (in Russian). 2009 Tarko A.M. Modeling the role of the biosphere in the compensation of global warming. Proceedings National Conference with international participation EcoMathMod-2009, published by A.P. Vinogradov Institute of Mathematical Problems of Biology. Pushchino, Russia, 2009. p. 270-271. (in Russian). 2009 Tarko A.M. A mathematical model of the global carbon cycle in the biosphere. Journal of General Biology. 2009. (in Russian).